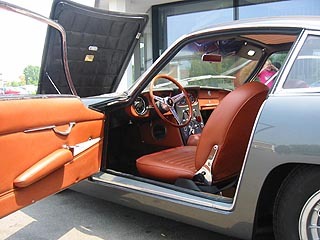 The 400GT2+2 debuted at the Geneva Salon in March of 1966. 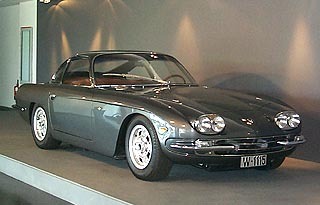 While having very similar styling to the 350GT and 400GT it was a very different car. Most notable amoung the changes introded on this model were the increased headroom and 2+2 seating. The +2 arrangement necessitated the lowering of the floorpan and raising the roof 2.6 inches giving 50.6 inches in overall height. The car thus has a slightly taller appearance from the front. 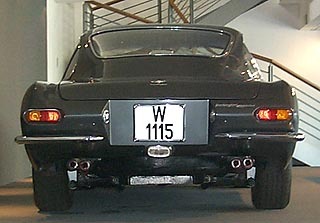 In the rear the trunk was enlarged and the window reduced giving the 2+2 an obviously different appearance from the 350GT. Other notable exterior modifications included the addition of a second windshield wiper, 4 circular sealed beam headlights and a little extra metal between the front wheel arch and the accent crease. Extra room was found by reversing the upper and lower rear control arms in a front to rear arrangement. In spite of this difference the windshields were interchangable. The chin below the front bumper received a face lift, and the shape of the doors was altered. Other less obvious changes were also made. The body was now produced in steel rather than aluminum, due to ease of production and better durability. A single fuel tank of 23 US gallons replaced the dual 10.5 gallon tanks on the previous models. 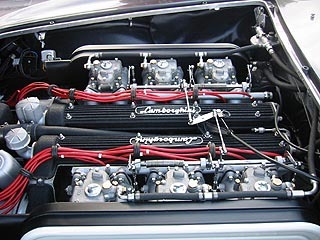 The most notable change was that this car now had a Lamborghini produced transmission and differential. The transmission having the Porsche style baulk-ring syncronizer system on all five forward gears and surprisingly on reaverse as well. All agree that this new transmission was much smoother and quieter than the previous ZF unit of the 350/400gts. The chassis went virtually unchanged except for the aforementioned reversing of the rear control arms. Stiffer springs and shocks were added and slight modification were made to the wishbones to handle the increase in wieght. 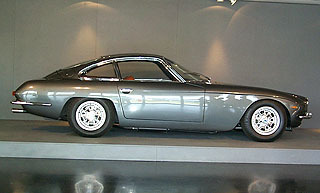 The new 400GT 2+2 listed for $14,750 in the US, up $500 over the 400GT. 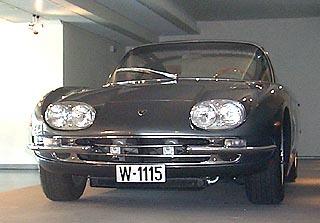 Only 242 were built including the Flying Star II and the Neri and Bonacini Monza 400.